AA Members, students and alumni are invited to join the 2016 RIBA Stephen Lawrence Prize winner Taro Tsuruta (AADipl 1996) on this visit to the iconic Hopkins’ designed Westminster Underground Station and the accompanying parliamentary building of Portcullis House. 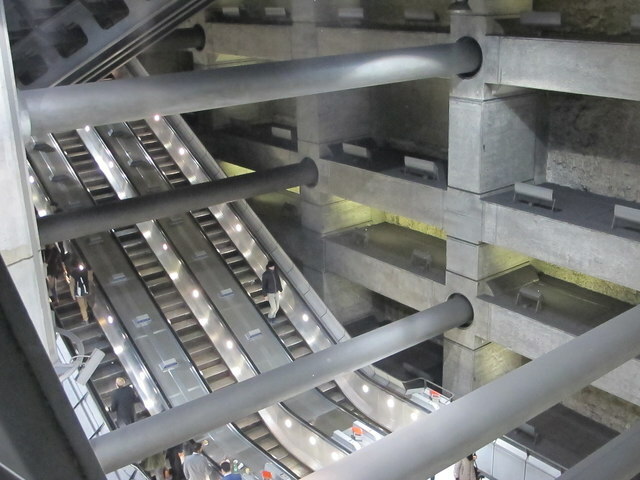 Completed in 1999 and shortlisted for the Stirling Prize, the station has been described as a “dramatic concrete well, woven with stacked banks of escalators that hang from a dynamic network of flying concrete beams and steel tubes”. Both a building visit and an on-site conversation, AA Building Conversations combines two of the best bits about architecture: walking through buildings and talking about them. AA Building Conversations brings together practising architects and the AA community to discuss in-situ how existing buildings in London have influenced, sharpened or challenged the architects’ own practices and understanding of the discipline. The conversations will be triggered by AA graduate school students Alvaro Velasco Perez and Raül Avilla, but will be a collective construction among all those present. Tsuruta Architects was established in 2006 by Taro Tsuruta, an experienced Japanese architect. Tsuruta worked with leading London design practices on complex multi-award winning projects before setting up his own studio. His original designs are informed by an exacting understanding of construction technology, combined with a deep respect for light, materials, context and the practicalities of everyday life. The practice has enjoyed critical acclaim for House of Trace – a radically different approach to home redevelopment. The project was warmly received in the press and gained numerous industry awards, most notably the Royal Institute of British Architects’ Stephen Lawrence Prize 2016. Please note you will require an Oyster Card of contactless payment card to access Westminster Underground Station as part of this visit. Open to AA Members, students, and alumni. Book your place using the form below. Posted on October 27, 2017 October 25, 2017 by membership	Bookmark the permalink.